Greetings from Tokyo once again!! This will be the last batch of weekend specials for the year and they will resume back up on the 14th of January. We have created a quick reference link to show the individual items that qualify for FREE Shipping on individual purchases. For individual items of similar size that are valued under this amount many of these items can still qualify with the addition of another small item. 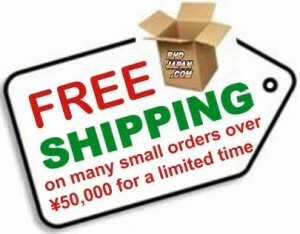 List of Items that Qualify for FREE Shipping!Greetings from Tokyo once again!! This will be the last batch of weekend specials for the year and they will resume back up on the 14th of January. List of Items that Qualify for FREE Shipping! Exedy Clutch Campaign ~March 24 » « FREE MUGEN 2011 Calendar! !